The purpose of this study is to develop a system for detecting target persons using a 3D laser scanner. The system consists of two parts — one for grouping and one for determining targets. The grouping part effectively segments individual objects by using two-step grouping. The target part determines target persons for grouping results using shape features. Experimental results showed that our proposed system detects targets as well as existing methods do and that our proposed method performs more quickly than existing methods do. 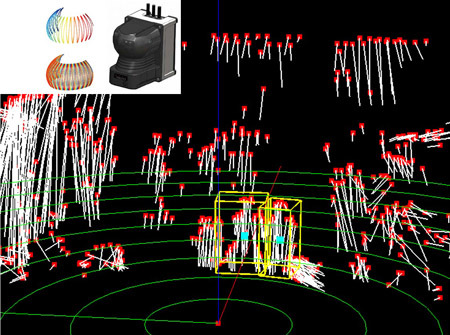 K. Hosaka and T. Tomizawa, “A Person Detection Method Using 3D Laser Scanner – Proposal of Efficient Grouping Method of Point Cloud Data –,” J. Robot. Mechatron., Vol.27, No.4, pp. 374-381, 2015. T. Tomizawa, A. Ohya, and S. Yuta, “Remote Book Browsing System using a Mobile Manipulator,” Proc. of the 2003 IEEE Int. Conf. on Robotics & Automation, pp. 256-261, 2003. S. Muramatsu, T. Tomizawa, S. Kudoh, and T. Suehiro, “Development of Intelligent Mobile Cart in a Crowded Environment – Robust Localization Technique with Unknown Objects –,” J. of Robotics and Mechatronics, Vol.26, No.2, pp. 204-213, 2014. M. Sato, T. Tomizawa, S. Kudoh, and T. Suehiro, “Development of Danger Avoidance Assist System for Electric Cart,” J. of Robotics and Mechatronics, Vol.25, No.6, pp. 1011-1019, 2013. K. Okawa, “Three Tiered Self-Localization of Two Position Estimation Using Three Dimensional Environment Map and Gyro-Odometry,” J. of Robotics and Mechatronics, Vol.26, No.2, pp. 196-203, 2014. T. Yoshida, K. Irie, E. Koyanagi, and M. Tomono, “A Sensor Platform for Outdoor Navigation Using Gyro-assisted Odometry and Roundly-swinging 3D Laser Scanner,” IEEE/RSJ Int. Conf. on Intelligent Robots and Systems, pp. 1414-1420, 2010. K. Yamauchi, N. Akai, R. Unai, K. Inoue, and K. Ozaki, “Person Detection Method Based on Color Layout in Real World Robot Challenge 2013,” J. of Robotics and Mechatronics, Vol.26, No.2, pp. 151-157, 2014. J. Eguchi and K. Ozaki, “Development of the Autonomous Mobile Robot for Target-Searching in Urban Areas in the Tsukuba Challenge 2013,” J. of Robotics and Mechatronics, Vol.26, No.2, pp. 166-176, 2014. J. Kikuchi, H. Date, S. Ohkawa, V. Labat, and Y. Takita, “Hierarchical approach using camera and LIDAR for searching people by autonomous mobile robot,” The 14th SICE System Integration Division Annual Conf., 1A2-5, 2013 (in Japanese). M. Yoshida, A. Matsumoto, I. Takagi, T. Yamada, and A. Ohya, “Development of Mobile Robot for Searching Lost Children,” The 14th SICE System Integration Division Annual Conference, 1A3-4, 2013 (in Japanese). A. Carballo, A. Ohya, and S. Yuta, “Laser Reflection Intensity and Multi-Layered Laser Range Finders for People Detection,” IEEE Int. Symp. on Robot and Human Interactive Communication, pp. 379-384, 2010. J. Kikuchi, H. Date, S. Ohkawa, Y. Takita, and K. Kobayashi, “Human Detection on Sitting State Using 3D LIDAR,” The 31st Conf. of the Robotics Society of Japan, 1E3-03, 2013 (in Japanese). T. Yokota and Y. Kuroda, “Human Recognition by Extracting Shape Features from LIDAR Data,” JSME Conf. on Robotics and Mechatronics, 3P1-K04, 2014 (in Japanese). K. Klasing, D. Wollherr, and M. Buss, “A Clustering Method for Efficient Segmentation of 3D Laser Data,” IEEE Int. Conf. on Robotics and Automation, pp. 4043-4048, 2008. R. B. Rusu and S. Cousins, “3D is here: Point Cloud Library (PCL),” Proc. of the 2011 Int. Conf. on Robotics and Automation, 2011. S. Akamatsu, N. Shimaji, and T. Tomizawa, “Development of a Person Counting System Using a 3D Laser Scanner,” Int. Conf. on Robotics and Biomimetics (ROBIO2014), pp. 1983-1988, 2014.